SKF has a broad portfolio of extremely powerful software for the calculation and simulation of all types of rolling bearings. Among these are highly complex systems, which can investigate bearing behaviour in a virtual environment: With the tool SimPro Expert, for example, highly skilled specialists can calculate rolling bearing fatigue based on SKF’s extended bearing life theory. This software reflects not only years of research and development, but also decades of operating experience. 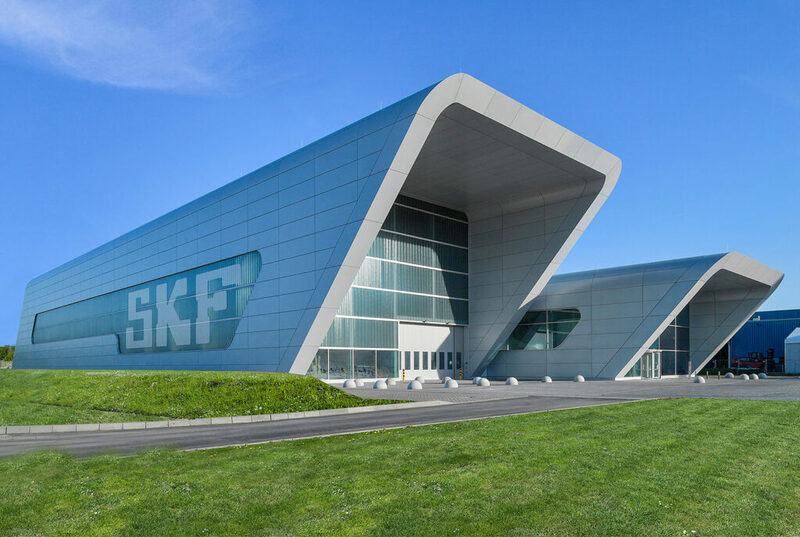 The same applies to an even more powerful instrument, called BEAST, which SKF engineers use to simulate the detailed dynamics inside a bearing. BEAST is a virtual test rig that performs studies of loads, moments, etc., inside a bearing under virtually any load condition. However, neither this software nor in fact any other simulation program has been able to reproduce what goes on inside large-size bearings in a truly realistic manner – until now. Experience has shown that some large-size bearings have been prone to premature damage and failure, despite having been calculated with the utmost meticulousness, incorporating additional safety margins by design and manufactured to highest standards. So, it is obvious that in real applications some phenomena appear that are not fully considered by the cause-and-effect algorithms of current simulation models. At present, no simulation program in the world is able to reproduce all the dynamic processes inside large-size bearings in a truly realistic manner. Two new test rigs in SKF’s state-of-the-art Sven Wingquist Test Center in Schweinfurt, Germany, can deliver deeper insights, which will help to improve current simulation models make calculations closer to reality. In addition, the acquired know-how will be incorporated into product development and help to ensure that future large-size bearing generations achieve maximum durability in their respective application at the lowest possible weight and amount of friction. Everything together can save resources – not only during testing and in production, but also in the business application of future SKF large-size bearings. The environment and customers will benefit equally. Fig. 1: The twin buildings of the Sven Wingquist Test Center, home to the most powerful bearing test rigs in the world. 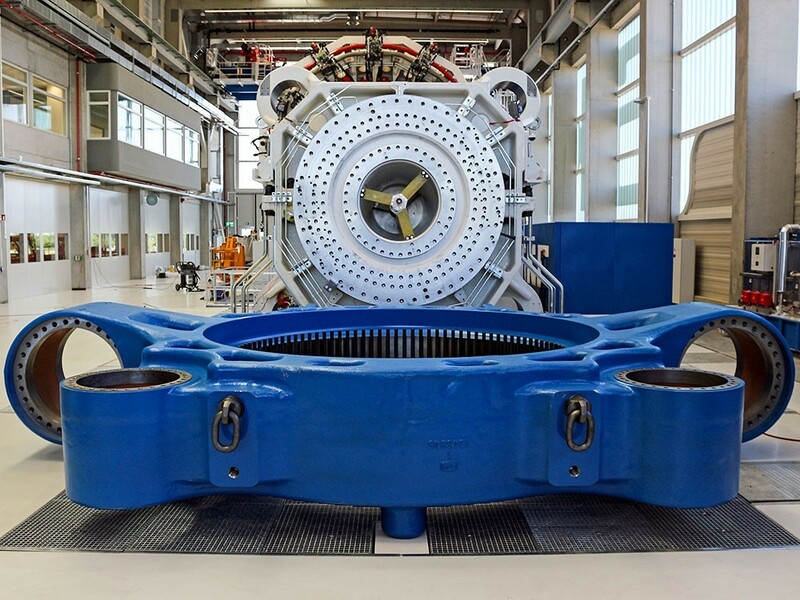 Revealing the hitherto hidden root causes of such damage is the reason that SKF has invested some 40 million euros in the Sven Wingquist Test Center, the world’s most powerful large-size bearing test centre, situated in Schweinfurt, Germany. In the centre’s futuristic- looking twin buildings (fig. 1), two new huge test rigs can drive and test large-size bearings to their absolute limits. The largest of the rigs (fig. 2) is the first test rig in the world that can not only test a single wind energy bearing (with an outside diameter of up to 6 m), but also the complete bearing assembly – including adjacent customer components. With overall dimensions of about 9 x 11 x 8 m, the giant rig weighs about 700 tonnes. It is equipped with a massive number of 64 radially and axially arranged cylinders, which can develop several meganewtons of dynamic loads. Fig. 2: The largest test rig – view from the top. The hydraulic cylinders initially act on an oversized steel discus (fig. 3) rotating inside the rig. This massive 7 m diameter disc weighs 125 tonnes. It transfers the forces delivered by the hydraulic cylinders to the specimen by means of an adapter, to which the tested bearing is attached. The approach of using the disc to transfer the available forces to the tested bearing has a decisive advantage: the forces acting on the specimen are not limited by the inherent stability of a bearing exerting the load. Instead, the system made up of the cylinders and the disc can apply loads over all axes, which in combination are several times heavier than those of the most powerful test facility of the past. On top of this, the new SKF test rig also achieves very high rotational speeds as compared with the dimensions of its tested bearing. Fig. 3: Assembly of the largest test rig. The massive 125-tonne disc is lifted and put into position in the lower half of the rig. The unique combination of dynamics, maximum forces and bending moments as well as rotational speeds eventually does contribute to a crucial economic benefit for the customer. To ensure the profitability of a wind turbine, its very large bearings should operate flawlessly for 20 years or more. These 20 years – including all conceivable loads in the course of this time – are reproduced by the new test rig very realistically within a few weeks, through an accelerated procedure. This not only saves a lot of time and money but also energy. 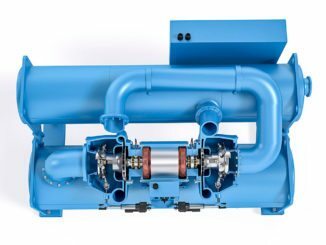 Still more energy is saved through a heat-recovery system: the heat generated in the rig goes into the system and is used for the test centre building and neighbouring large-size bearing factory. Because of its energy efficiency, the Bavarian Ministry of Economic Affairs and Media, Energy and Technology has funded the giant testing device with some 1.9 million euros. 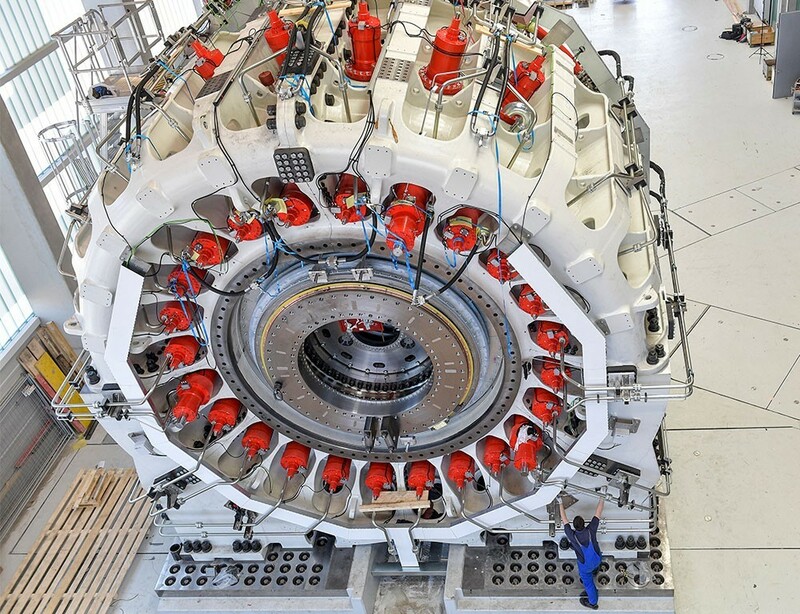 To ensure that the rig applies its enormous forces to the tested bearing with the highest control, its lower housing segments have been fixed on their pedestals by about 200 M80 threaded bolts with a pre-load of several meganewtons. The bases in which these bolts are inserted are part of a 3,000-tonne foundation, which is decoupled from the rest of the open and airy building – to avoid disturbing interaction with the building itself. In view of the extremely solid substructure, the precision work at the interface between the pedestals and the housing is all the more astonishing: the contact surfaces have only a few tenths of a millimetre deviation in evenness over a distance of about 10 m (fig. 4). Fig. 4: Assembly of the large test rig, close to completion. By comparison, the smaller of the two new SKF test rigs (fig. 5) looks less monumental – but it is nevertheless a mighty tool as well. 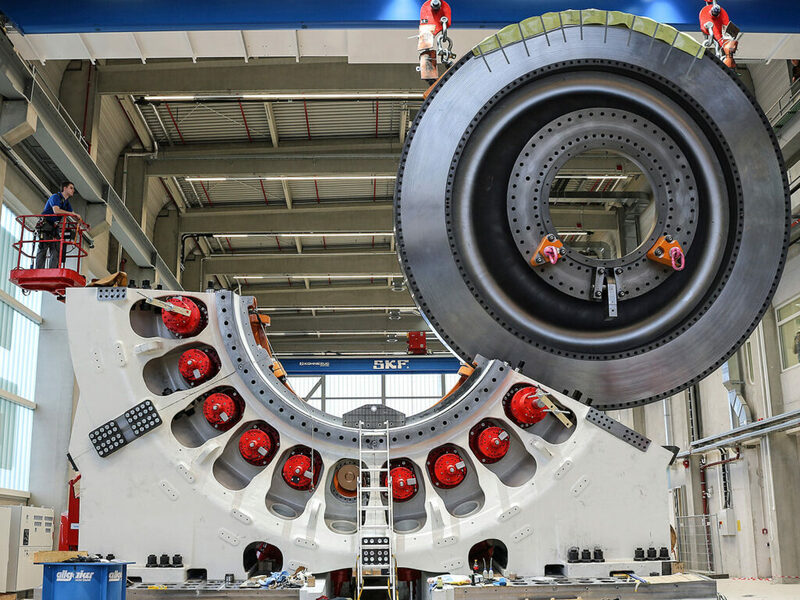 Its 130-tonne test head is equipped with four axial and two radial cylinders, which can act on a wide variety of large-size bearings through the use of inner and outer ring adapters. For example, the tested bearings can be used for applications in shipbuilding, mining and the iron & steel, pulp & paper and cement industries. So, this rig is extremely versatile. Despite its flexibility, it is a very massive masterpiece of mechatronics, too. The device weighs around 300 tonnes. Fig. 5: Final assembly of the smaller test rig. This rig will drive bearings to their limits, used in applications such as shipbuilding, mining and the iron & steel, pulp & paper and cement industries. This rig develops forces of more than six meganewtons (approximately as much as a single engine of the Saturn V moon rocket) and achieves rotational speeds of more than 200 r/min. By combining such loads and speeds, even this “David” of the two new SKF test stands is unrivaled worldwide. 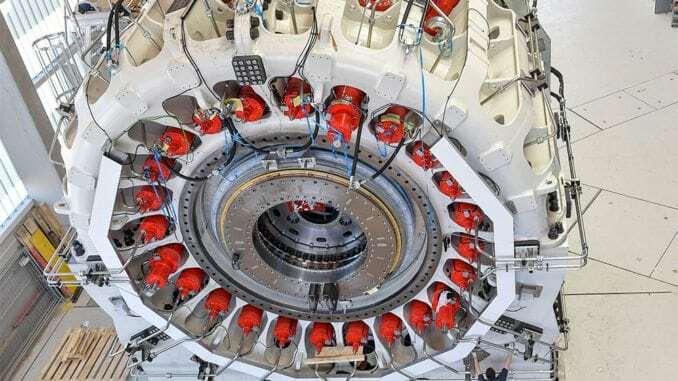 With its unique capabilities, the test rig can reveal significant potentials for energy and material savings in the production of large-size bearings. This is one reason why the rig was included in the Environmental Innovation Program of the German Federal Ministry for the Environment, Nature Conservation, Building and Nuclear Safety and awarded some 1.6 million euros in funding. 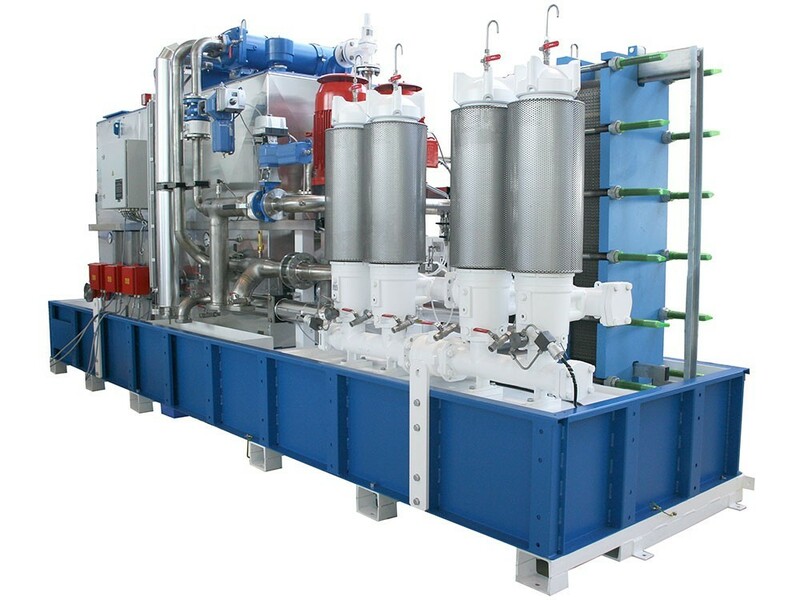 The centre’s smaller test rig features another unusual characteristic: It is equipped with special lubrication equipment from SKF Lubrication Systems (fig. 6). 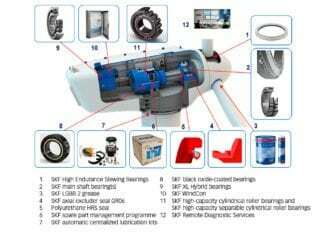 Usually, the company’s solutions ensure that bearings in diverse applications are optimally supplied with the right amount of lubricant at the right time. However, the purpose-built system for the test centre is capable of the exact opposite: When testing, it can drive the tested bearing to its boundaries in terms of deficient lubrication. 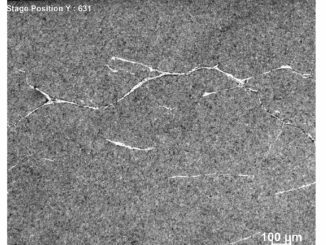 The results can deliver important findings for further improvement of large-size bearing robustness. The approximately 6 m wide by 1.6 m deep aggregate holds 3,000 litres of lubricating oil and weighs a total of 7.2 tonnes. Basically, it is a technology transfer from the pulp & paper industry, but SKF’s lubrication system experts comprehensively modified it according to the specific requirements of the test centre. Also noteworthy are the exceptional optical design of the device and its rather uncommon noise protection measures. Fig. 6: A unique lubrication system enables large-size bearings for heavy industries to be exposed to most difficult lubrication conditions under a wide variety of loads. To expose the tested bearing not only to extreme loading conditions but also to extreme lubrication conditions, SKF has designed the system for oil temperatures about twice as high as are found in conventional solutions. Thus the available temperature range can be used to create enormous tribological stresses to the tested bearing. To avoid damage to the lubrication system itself during a “hot fight” with the tested bearing, a cooling system based on plate heat exchangers has been installed. 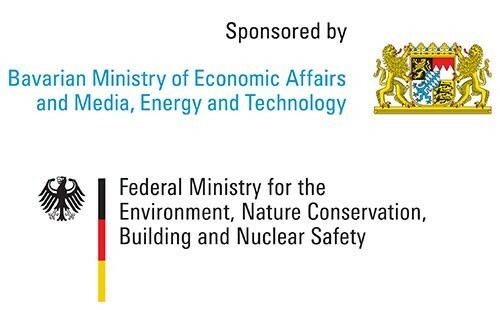 The Bavarian Ministry of Economic Affairs and Media, Energy and Technology has funded the larger test rig 1.9 million euros in funding, while the smaller rig was included in the Environmental Innovation Program of the German Federal Ministry for the Environment, Nature Conservation, Building and Nuclear Safety and was awarded about 1.6 million euros in funding. From the supply station the lubricating oil is pumped to the tested bearing through a dozen lines. An interconnected distribution console enables precise metering of the oil per line and lubrication point. As a result, the testers can also produce most difficult lubrication conditions under a wide variety of loads. In addition, the variable dosage in combination with the multitude of lubrication points enables oil distribution or the internal flow within the test piece to be examined extremely locally. For this purpose, the adapter holding the tested bearing is provided with a whole arsenal of supplemental sensors. These sensors not only detect local temperatures and their trends, but they also detect vibration levels, loads and the positions of critical components. Ultimately, SKF experts can find out exactly which dynamic effects occur in the bearing, where they occur and under which conditions. 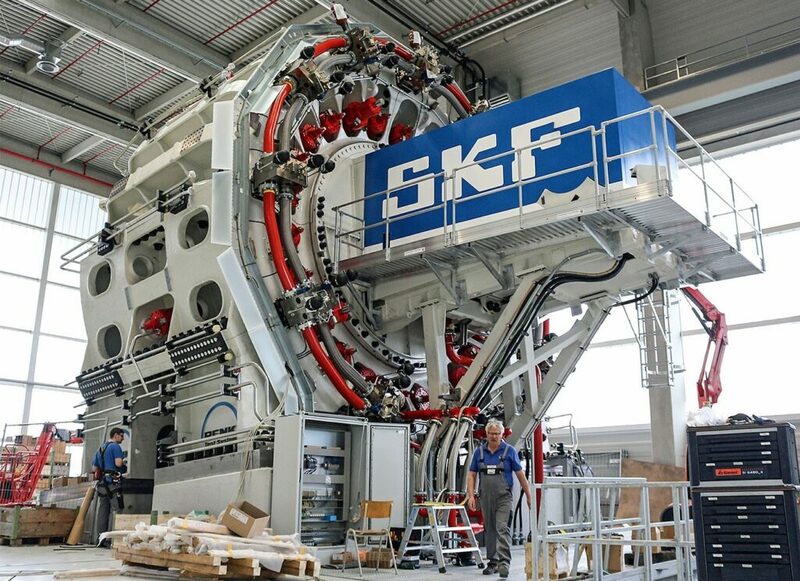 Right now, SKF engineers do their utmost to ensure that the testing spadework meets the extremely high expectations in terms of revealing hidden secrets within large-size bearings. Currently, they are actually working on the validation of the massive hardware and the calibration of the sensitive measuring technology.